On Saturday, June 13, Express Employment Professionals offices across North America will gather together for Brand It Blue Day. The event is a day of service aimed to help in the fight against hunger, and you can be a part of it! Summer is an especially difficult time of year for children as most of the school meal programs end, leaving millions of kids at risk of going hungry. In 2013, more than 21.5 million children received free or reduced-price meals through their school programs and only 2.5 million of those children took part in summer food service programs. In Canada, more than 310,000 children receive their meals through food banks each month. In 2014, 205 Express offices participated in Brand It Blue Day and more than 1,000 volunteers showed up at their local food pantries to help. Thanks to everyone’s help, Express was able to collect enough food and donations to provide more than 55,000 meals to those in need. During the past two years, Express has supplied more than 91,000 meals. Volunteering adds valuable experience to your resume. Whether you’re a job seeker who just graduated or someone who has been out of the workforce for an extended period of time, volunteering can help add to your work history and set you apart from the competition. Spending your time serving in your community helps you gain networking opportunities that can lead to jobs, provides new skills that you can add to your resume, and shows you have a passion for helping others. In fact, a recent report by the Corporation for National and Community Service found that volunteering was associated with 27% higher odds of employment. Now that you know the impact of Brand It Blue Day and the value of volunteering, you may be wondering how you can be part of the big event. 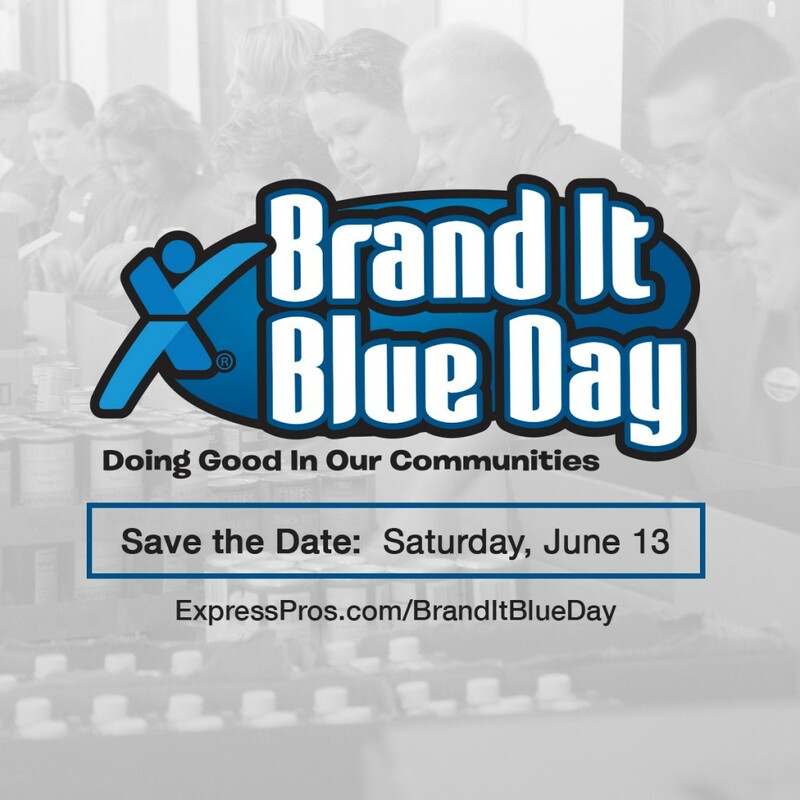 If the Express office in your city is taking part in Brand It Blue Day, you may be able to volunteer your time at a food bank or bring in donations to a canned food drive. Contact your local Express office and find out if they’ll be participating in this day of service so you can help!